This is my favorite version thanks to my sister’s neighbor in Montana, Debbie, who passed on this recipe years ago. The original recipe has a fruit filling that is quite different than my version below (incorporates blueberries and requires cooking the filling prior to baking) but it’s the topping that sold me. Tender and fluffy and buttery with just the right hint of sweetness. Yum. Cobbler topping forever. I know there are about one million three hundred and forty seven variations of fruit cobblers hanging around. But peach will always be my favorite. Always. 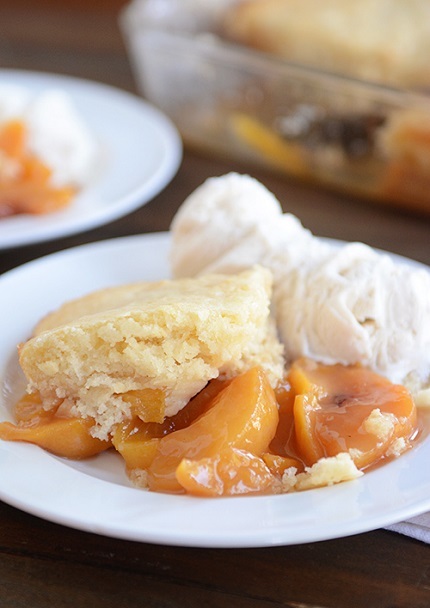 Peach and cobbler just belong together and this very classic, very delicious, very simple version is the one in my “favorites” folder. If using frozen peaches, use the same amount as in the recipe; thaw them completely, reserving any liquid that drains off to use for the 1/2 cup liquid in the peach layer (if it's not quite enough to equal 1/2 cup, supplement the rest with water). The peach layer will be juicier if using, well, juicy peaches. 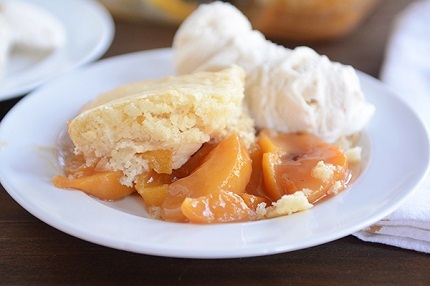 Using underripe or firm peaches (fresh or frozen) might result in a cobbler that is more dry. In a medium bowl, combine the peaches, brown sugar, and flour and mix. Add the water and lemon juice and stir to combine. Pour the mixture into the prepared pan.